The beautiful eighteen year old Karla Stanton, who is living in the country with her brother training horses, is astonished when her half-sister Penelope, now Lady Melford, who is renowned as a great beauty in London, unexpectedly calls on her. She wishes Karla to disguise herself as her aged aunt and chaperone and to go with her to Paris where she intends to spend three days, ostensibly shopping for clothes, but actually to be with the Marquis of Welbourne, who she is having a passionate affaire-de- coeur with. Karla who has never been out of England and who knows nothing of the Social world and its ways is astounded at the request and frightened that she would be unmasked. However, she obeys her sister when she produces a wig, dark spectacles and theatrical make-up to hide her face and make look much older. Karla is thrilled with the beauty and glamour of Paris where everything is new and intriguing to her. But the Marquis has a rival in the Duc de Alezia, who does his best to monopolise Penelope. How the first women’s horse race takes place privately on the famous Racecourse at Longchamps. 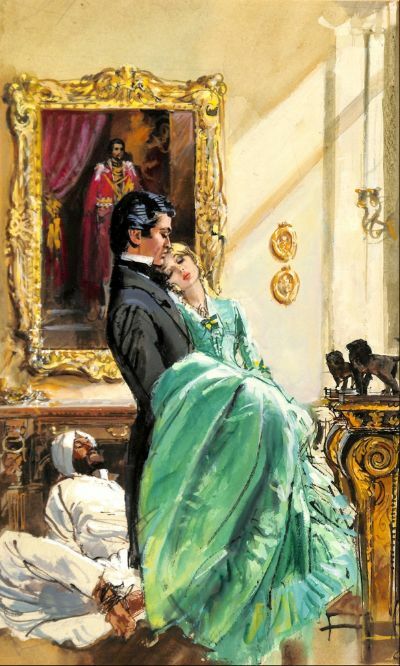 And how Karla saves her sister’s face and the Duc’s bet on his Arab stallion at the last moment and finally finds love is told in this unusual and fast-moving story by BARBARA CARTLAND.